This piece is framed. The price reflects the framed piece. Unframed dimensions: 46 × 58 inches. Eric Abrecht's work appears in galleries throughout the United States. Primarily working with the landscape as his subject matter, Abrecht allows the paint to develop its subject matter, rather than working from or recreating a specific scene. 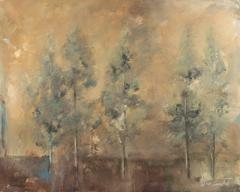 His pieces offer dreamy vistas into a landscape familiar to everyone who views his paintings. In using an impressionistic style, Abrecht is able to tell various stories through his broad brushstrokes and simple landscapes. By working conceptually, he allows the work to develop a freedom from the boundaries normally associated with the traditional landscape. The conceptual process also allows the notions of color and shape to be manipulated into a piece that leaves the viewer with questions as well as answers.